Pentair's ENVIROSEP® Varnish Control System solves the problem of varnish formation in lubrication and hydraulic systems. The technology was developed for turbines in the power industry to improve upon traditional varnish mitigation methods. This system prevents the sticking and seizing of valves and the fouling of heat exchangers, improving performance and reducing the costly risks of unplanned downtime. Varnish formation is a process that evolves from the over saturation of soluble oil products to form soft contaminants and finally varnish deposits. Ion exchange resin systems (left) require water. 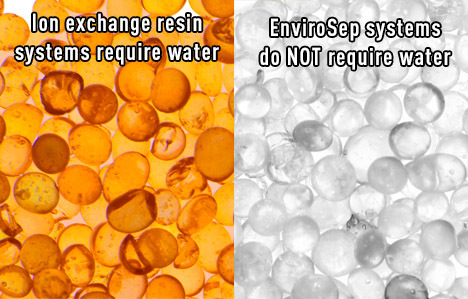 EnviroSep (right) uses proprietary adsorbent technology that does not require water. 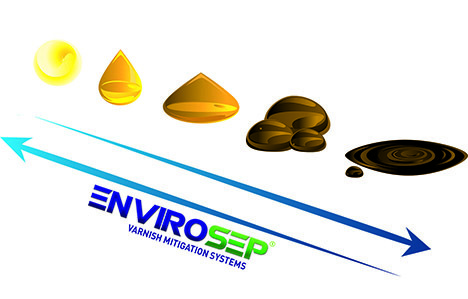 The ENVIROSEP Varnish Control System uses advanced adsorption and filtration technology to stop varnish formation and sustain high oil circulation rates. It removes the partially soluble gels, soft contaminants, and insoluble fine particles that can lead to varnish formation. Especially with the temperature extremes found in power generation turbines, they easily build up into a film that is very hard to remove and will reduce reliability and productivity. 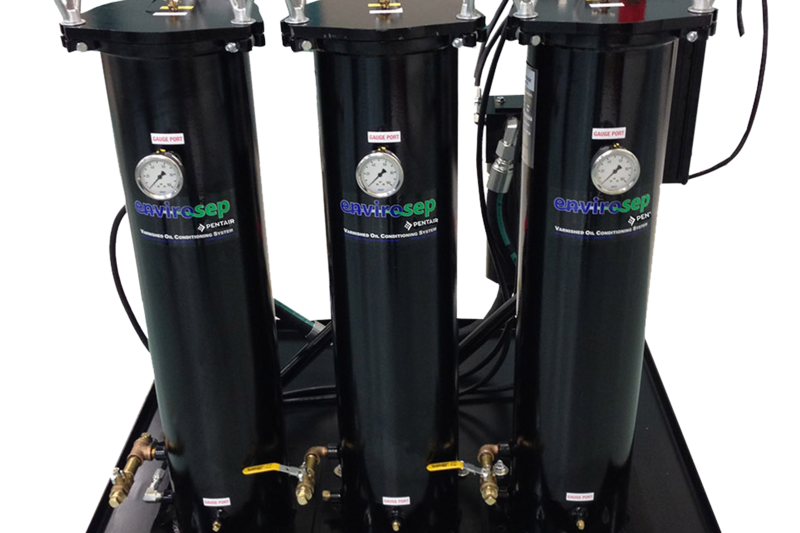 Pentair's varnish control system uses radial flow technology to quickly treat the entire reservoir and sustain high circulation rates. The system helps to restore the lubrication oil package, enabling long-term improvement in both oil quality and equipment reliability. Varnish formation in turbine oils has long been identified as a significant barrier to cost-effective and reliable power generation. Left untreated, varnish will lead to the fouling of turbine lubrication circuits and surfaces of heat exchangers, and to sticking or seizing valves. This will result in lower efficiency and reliability, and ultimately in unplanned maintenance shutdowns, or even more expensive turbine failures. The ENVIROSEP System disrupts the varnish formation process. The multistage technology utilizes three different filtration and adsorption mechanisms to capture non-soluble gels and materials, as well as the polymerized degradation compounds. This oil conditioning allows the turbine system to be used without taking it offline or disrupting power production. In the power industry, high-efficiency turbines operate at high temperatures to increase output. Under extreme operating conditions, including the low temperatures during planned shutdowns, lubrication systems become vulnerable to varnish formation, exposing plant owners and operators to potentially costly risks. Varnish formation is the result of oxidation and thermal degradation of the lubricant oil and its protective additives. The initial formation of sludge or tar is often accelerated by high or low turbulence conditions in the bends and orifices of the system. When deposits form a sticky layer that starts to collect fine mineral particles, high temperatures can lead to the buildup of a glazed film as difficult to remove as varnish. The ENVIROSEP Varnish Control System has proven itself in the tough conditions of turbine lubrication in power stations. As a movable solution, it can safeguard any industrial lubrication and hydraulic system at risk from varnish formation. Click here to download the product brochure Envirosep.